As I mentioned a few posts again, I'm taking part in an informal sock KAL. No rules except sign up and post an update and a photo. These are the socks I was making. A pretty terrible photo. I didn't realise just how poor it was till now. It was hot and I just wanted to get a photo and to take them off. I had to crop the photo fairly severely. There was a very large purple halo at the top, possibly a reflection from a car window down below. I haven't even put them on properly. They are baggy. However, they are finished. They did not have to be done in January, that was a condition I imposed on myself. It was suggested that life is too short to knit things I don't like. I would usually agree with that, but it was important to me to impose myself and my control on those socks. So I have finished them with 6.5 hours to spare on January 31. Two little granddaughters started at a new school on Tuesday. Their big brother goes there and is entering year 9. He turned 14 two weeks ago. They can get to and from school with him so before and after school care is not needed and the sliding scale of fees means that they are still paying around the same amount as last year with out of school care fees. I'll have to transfer a photo from my phone. One girls hair is long and very curly. Look in top right side bar. For the first day of school it was tightly pulled back and plaited. DIL must have spent ages on it. Their cousin, Miss 12, started High School and came home with a smile on her face. I hope it lasts. She's still finding her way after the split between her parents. Son is doing remarkably well although there are hiccups with a job in a restructure. He had another visit to psychologist yesterday who is still amazed at his progress in such a short time. They have mutually agreed that he is fine for now, although she will be very happy for him to return if he thinks he needs it. He is settling into a townhouse and life by himself for a lot of the time. He has had the children a reasonable amount in the holidays and they love that dad seems much happier than he was. So I am thinking of some tube socks as bed socks for the Western Suburbs three. I hate the things and never wear them, but they wear them every winter. I think I might raid the stash to find some machine washable 8 ply which will be quick and easy. DIL is not a careful washer of knitted things. Glad your grandchildren all seem happy at their schools. I bet you're glad to have those socks over and done with! 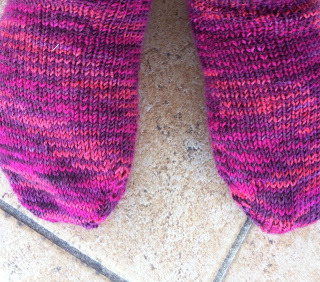 I just knit ordinary socks on 4mm needles for bed socks! So far, it's worked every time! Well if nothing else the socks are finished and you can begin something you lie better. Glad Miss 12 liked school and is settling in well. Hope the smaller ones have a lovely day too. Glad your son is feeling so well, it is nice to feel 'right' again! !